بخش کشاورزی همواره با مشکلاتی از جمله کمبود سرمایه و سرمایه‌گذاری مواجه می‌باشد. لذا صندوق‌های غیردولتی حمایت از توسعه بخش کشاورزی راه‌­حل مناسبی برای تزریق صحیح منابع مالی به این بخش می‌باشند. هدف اصلی این پژوهش "بررسی اثرات صندوق حمایت از توسعه بخش کشاورزی در استان آذربایجان غربی" بود. این پژوهش از نوع توصیفی- پیمایشی بود. جامعه آماری این پژوهش 173 تشکل سهام­دار صندوق حمایت از توسعه بخش کشاورزی بودند که بر پایه جدول مورگان تعداد 120 تشکل به عنوان نمونه انتخاب شدند. جهت انتخاب نمونه­ها از روش نمونه­گیری تصادفی ساده استفاده شد. ابزار تحقیق، پرسشنامه محقق ساخته بود که روایی آن بر اساس روش اعتبار محتوایی و پایایی آن با استفاده از ضریب آلفای کرونباخ بین 712/0 تا 935/0 تعیین شد. داده‌ها با استفاده از نرم‌افزار SPSS نسخه 21 تجزیه و تحلیل شدند. آماره تحلیل عاملی نوع (R-Type Factor Analysis) به­منظور تبیین اثرات صندوق حمایت از توسعه بخش کشاورزی بر توسعه کشاورزی استان آذربایجان غربی، استفاده شد. نتایج حاصل از تحلیل عاملی نشان داد که اثرات صندوق حمایت از توسعه بخش کشاورزی را می­توان در پنج عامل اثرات اقتصادی، اثرات اجتماعی، اثرات تولیدی، اثرات مهارتی و اثرات آموزشی دسته­بندی نمود. این عوامل در مجموع 42/71 درصد اثرات صندوق را بر توسعه کشاورزی استان آذربایجان غربی را تبیین کرده‌اند. "اعتبارات"؛ اثرات"؛ "صندوق توسعه کشاورزی"؛ "سهامداران"؛ "استان آذربایجان غربی"
1M.Sc. Graduated, Department of Agricultural Management, College of Agriculture, Mahabad Branch, Islamic Azad University, Mahabad, Iran. 2Assistant Professor, Department of Agricultural Management, College of Agriculture, Mahabad Branch, Islamic Azad University, Mahabad, Iran. The agricultural sector in the West Azerbaijan province is faced with problems such as lack of capital and investment. Therefore, non-governmental funds for agricultural investment are a suitable solution for correct injection of funds to the agricultural sector. The purpose of this research was to study the effects of Agricultural Supporting Fund in the West Azerbaijan province. The research methodology was a descriptive – survey. The statistical population included 173 organizations of fund shareholders from whom 120 samples were determined by using the Kerejcie and Morgan table. The sampling and selection technique used for choosing the sample society was the stratified random sampling technique. The main tool of data collection was simple random sampling. The main tool of data collection was a questionnaire whose validity and reliability was confirmed by experts and Cronbach's alpha coefficient was between 0.712 to 0.935. Data were analyzed by using the SPSS (V.21) software. 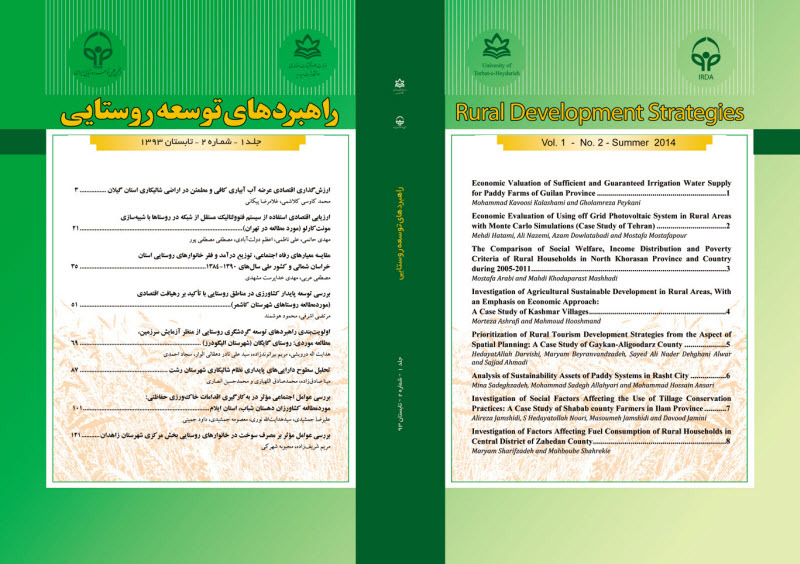 The R-factor analysis was used to explain the effects of the agricultural supporting fund on agricultural development in the West Azarbaijan province. The results of factor analyses showed that the effects of Agricultural Investment Fund in the West Azerbaijan Province can be classified in 5 effects that include; Economic effects, Social effects, Production effects, Skill effects and Educational effects. These items explained 71.42% of the total variation related to the Agricultural Investment Fund effects in the West Azarbaijan Province. "Credits", "Effects", "Agricultural Supporting Fund", "Shareholders", "West Azerbaijan Province"